Melody Time (RKO, 1948) Folded, Fine/Very Fine. One Sheet (27" X 41"). Animation. Starring Roy Rogers, Dennis Day, The Andrews Sisters, Frances Langford, Freddy Martin, Ethel Smith, Buddy Clark, Fred Waring, Sons of the Pioneers, Luana Patten and Bobby Driscoll. Directed by Clyde Geronimi, Wilfred Jackson, Jack Kinney and Hamilton Luske. 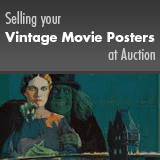 An unrestored poster that displays signs of use including edge and fold wear, creasing, unobtrusive stains or smudges, fold separations, minute paper loss, and some tears. There is some paper tape on the verso bracing the fold separations. A Walt Disney Production. Folded, Fine/Very Fine.